Expo 67 attracted over 50 million visitors, a remarkable performance for a country with a population of only 20 million. Aside from London’s Great Exhibition of 1851 and the one in Paris in 1889, no exhibition has ever produced such an explosion in its host country and in the world. Expo 67 attracted over 50 million visitors, a remarkable performance for a country with a population of only 20 million. It reunited 62 nations: a record. Expo 67 made history through its avant-garde ambition and humanity, giving a new meaning to the word Canada according to Robert Fulford in 1968, in Portrait de l’Expo. Expo 67 was, first and foremost, something of a miracle. Its organizers only had four and a half years to prepare – instead of the usual seven. The fault lies in Moscow, designated host city of the 1967 Universal Exhibition by the Bureau International des Expositions (BIE) in May 1960 in anticipation of the Russian Revolution 50th Anniversary. (The Canadian nomination was defeated in the fifth round by 14 votes against 16.) But two years later, the Soviet Union desists, officially because of cost, officiously out of fear of capitalist propaganda. 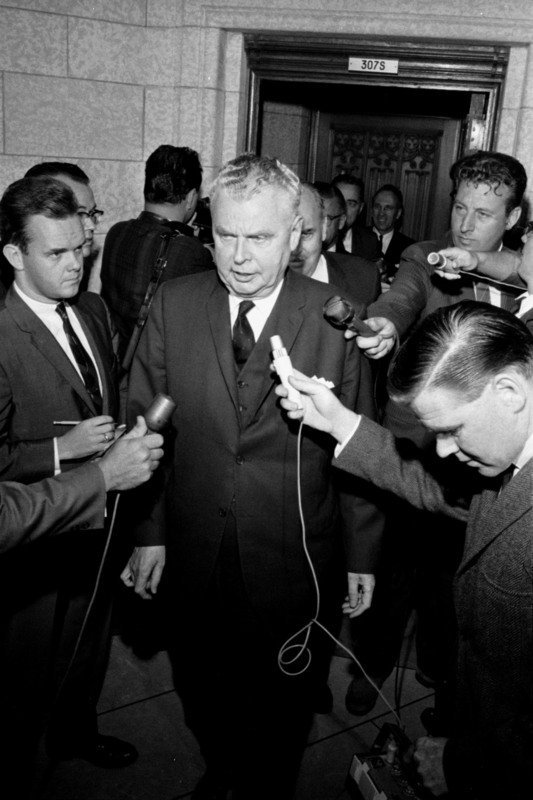 The Mayor of Montréal, Jean Drapeau, convinces Prime Minister Diefenbaker to resume the project, with could coincide with the Canadian Centennial. On November 13, 1963, the BIE unanimously votes in favour of the Canadian candidacy: the 1967 Universal Exhibition will open its doors in Montreal on April 28, 1967 – in four years, five months and 15 days. The organising committee quickly addresses the location problem. Where to find 5 square kilometres near Downtown and the main routes? 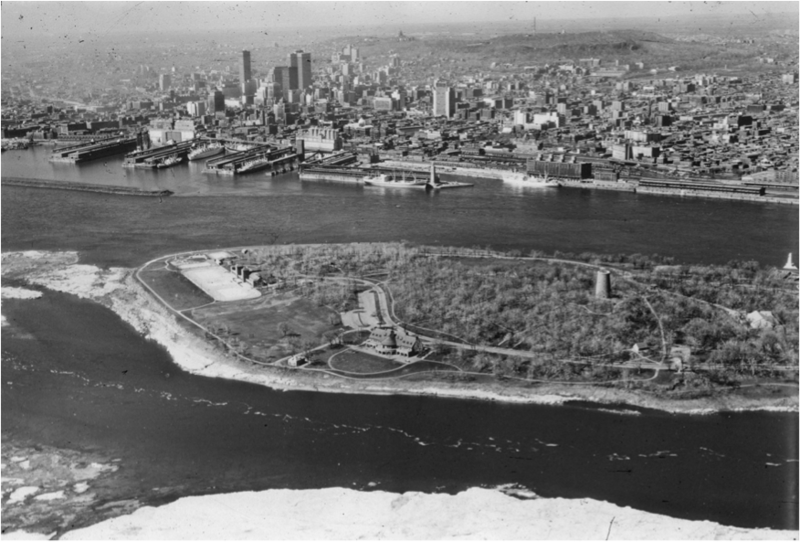 While the organizing committee considers half-a-dozen options, Mayor Jean Drapeau makes an ambitious announcement: Expo 67 will be held in the middle of the Saint-Lawrence… On an island that doesn’t yet exist! It’s a matter of back-filling islands and spawning grounds to extend Saint-Helen’s Island and building a new 2 km2 island from scratch, which is to be Notre-Dame Island. The idea isn’t as crazy as it seems: it makes it possible to completely avoid property speculation, all the while offering Expo the most beautiful site possible. But it does add the Herculean difficulty of an impossible deadline: 11 months and a million truck loads to haul 28 million cubic meters of rock and earth! Against the advice of the organizers, Drapeau persuades Ottawa and Quebec that his idea is best. 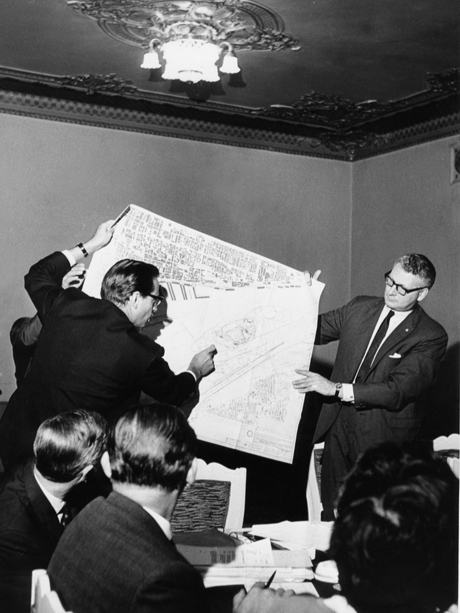 But when construction begins in August, 1963, Paul Bienvenu and Cecil Carsley, the two leaders of the organization committee, resign! Even a computer program at the prestigious Stanford Research Institute in California predicts that Expo won’t be completed before 1968, even 1969. The majority of public and political leaders think it should be postponed or canceled. But Expo 67 isn’t going anywhere. Expo 67 will be saved by its two new officials, appointed in the beginning of September. 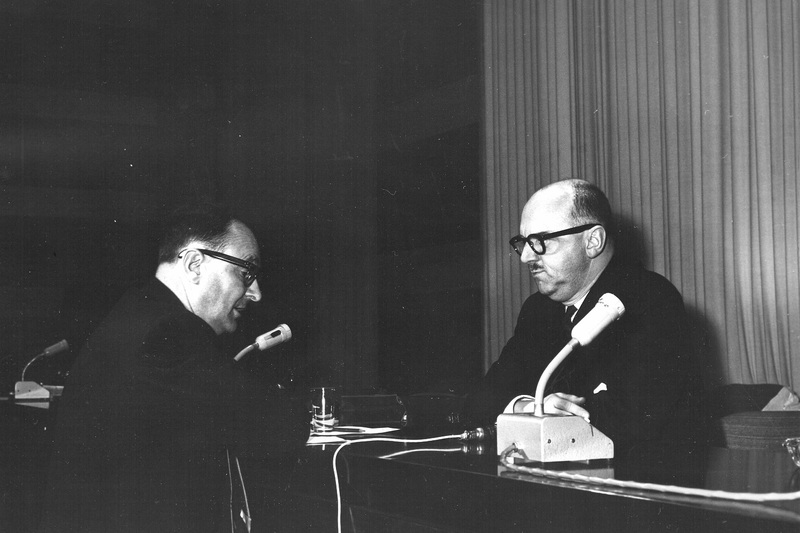 The new General Commissioner, Ambassador Pierre Dupuy, worked many years for BIE, making him one of the best of all specialists for this kind of event. As for the Deputy General, Engineer Robert Fletcher Shaw, he runs the largest engineering firm in Canada, which makes him the best person to have for supervision, including construction. The tandem revives Expo 67 with a breath of optimism, according to journalist Raymond Grenier in a precursory book published in 1965: Regard sur l’Expo. Dupuy and Shaw are categorically agree that the islands are the best choice in terms of engineering and aesthetics, as well as for event sales. Expo will truly be held in 1967! The group takes on the nickname: “Les Durs”, as in the tough guys, through their inflexible will to make Expo happen and impose their decisions, even upon the government. In December 1963, Prime Minister Pearson learns with stupor that the budget has gone from 40 to 167 millions dollars – it is barely adopted, by one vote! The fierce Opposition attacks everything: the choice of logo, the theme song, the hostess’ uniform, but nothing can be done: Les Durs continue to do as they please. Even while the social climate is put to the claims, they will even obtain labour peace for the duration of the work. In June of 1964, the City of Montreal officially presents the islands to the Organising Committee… There are only two years and nine months left – 1015 days! – to complete an incredible task. They need to build 847 pavilions and buildings, 27 bridges, 75 km of road and sidewalks, 40 km sewers, 150 km of canals, 25 000 parking spaces, 256 basin and 6150 lampposts. It all rests on the shoulders of the Director of Installations: Colonel Edward Churchill, who will coordinate over 6000 workers. During the Second World War, this military man from Manitoba contributed to the Allied advance by working on the construction of 192 airports. All in good time, Edward Churchill borrows an organisation technique from NASA: the critical path method. “This technique that was very new for its time consists in distributing the work so as to build 178 or 180 pavilions at once, at the same time,” remembers Director of Public Relation Yves Jasmin. Technologically advanced methods allow for Churchill to to order all the materials at the once, to build all foundations and infrastructures in one shot and oversee the construction of some hundred building at the same time in a specific order. As of winter 1965, he is already planting trees! 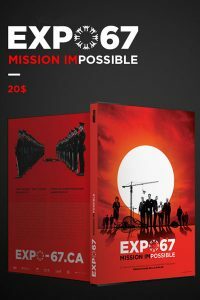 Expo 67 will not only be ready on time: it will be perfect!